The overall aim is to enroll 1 million or more volunteers and oversample communities that have been underrepresented in research to make the program the largest, most diverse resource of its kind.The National Institutes of Health opened national enrollment for the All of Us Research Program — a momentous effort to advance individualized prevention, treatment and care for people of all backgrounds — in collaboration with the University of Alabama at Birmingham, Cooper Green Mercy Health Services and other partners. In the state of Alabama, people age 19 and older, regardless of health status, are able to enroll. The official launch date, Sunday, May 6, was marked by community events in cities across the country as well as an online event. UAB held a celebratory launch event at Railroad Park from 2-6 p.m., with local entertainment, interactive activities, food trucks and speakers. Volunteers will join more than 25,000 participants across the United States who have already enrolled in All of Us as part of a yearlong beta test to prepare for the program’s national launch. The overall aim is to enroll 1 million or more volunteers and oversample communities that have been underrepresented in research to make the program the largest, most diverse resource of its kind. “The time is now to transform how we conduct research — with participants as partners — to shed new light on how to stay healthy and manage disease in more personalized ways. This is what we can accomplish through All of Us,” said NIH Director Francis S. Collins, M.D., Ph.D.
All of Us seeks to transform the relationship between researchers and participants, bringing them together as partners to inform the program’s directions, goals and responsible return of research information. Participants will be able to access their own health information, summary data about the entire participant community, and information about studies and findings that come from All of Us. Participants are asked to share different types of health and lifestyle information, including through online surveys and electronic health records (EHRs), which will continue to be collected over the course of the program. At different times over the coming months and years, some participants will be asked to visit a local partner site to provide blood and urine samples and to have basic physical measurements taken, such as height and weight. To ensure that the program gathers information from all types of people, especially those who have been underrepresented in research, not everyone will be asked to give physical measurements and samples. In the future, participants may be invited to share data through wearable devices and to join follow-up research studies, including clinical trials. Also in future phases of the program, children will be able to enroll, and the program will add more data types, such as genetic data. In addition, data from the program will be broadly accessible for research purposes. 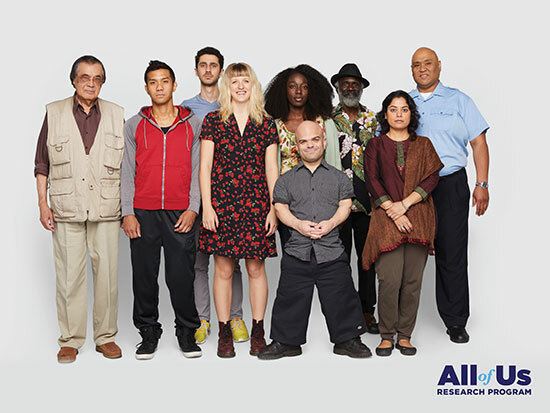 Ultimately, the All of Us Research Program will be a rich and open data resource for traditional academic researchers as well as citizen-scientists — and everyone in between. NIH has funded more than 100 organizations throughout the United States to be partners in the program, including UAB, the lead institution for the Southern All of Us Network, which includes 12 universities or medical facilities in Alabama, Mississippi and Louisiana. On the program’s May 6 launch date, the All of Us Research Program hosted special events in diverse communities around the country. The UAB event included the NIH mobile interactive exhibit, where visitors explored the All of Us Journey. The event also featured Zumba and cooking demonstrations, a community education fair, and musical performances, along with remarks from Watts, Vickers, Dr. Stephen Olufemi Sodeke, PhD, bioethicist and professor of Allied Health Sciences at Tuskegee University, and Stephen Mikita, JD, a motivational speaker, All of Us participant and representative of the Spinal Muscular Atrophy Foundation from Salt Lake City, Utah. People also took part in social media activities (#JoinAllofUs) and tuned in to watch speakers across the country talk about precision medicine and the power of volunteering for research. “All of Us” is a registered service mark of the U.S. Department of Health and Human Services (HHS).